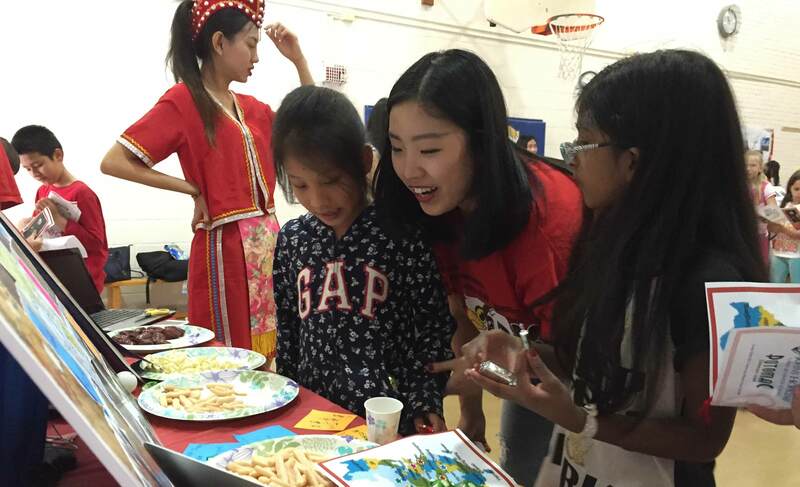 About 50 native Chinese students at the Johns Hopkins Carey Business School visited Potomac Elementary School recently to host a Chinese City Expo for the grade school’s more than 500 students, many of whom are in a Chinese language immersion program at the school. The April 22 event comprised several exhibits created and crewed by the Carey students enrolled at the business school’s Washington, D.C. campus located nearby the suburban elementary school. Each exhibit represented a different Chinese city and featured pictures, foods, games, fashion, and other cultural items native to that region. Several of the Chinese Carey students represented their hometowns. During the expo, the Potomac students collected stamps from each exhibit they stopped at and placed them into their “passports.” At the end of the tour, the students displayed their passports and received small prizes based on the number of cities they visited. According to Alex Wei, one of the two co-organizers of the event, the inspiration for the expo came from a desire to give back to the local community. “Since Carey has a portion of the student body from China, we thought they could be a resource to the elementary school students in the Chinese immersion program” Wei said. The event was created through a collaboration between two Carey clubs: the LEAD program, of which Wei is a member, and the Community Mentors Club, led by Cheng Ni, the other co-organizer of the expo. Ni said the expo was the most recent in a series of outreach events the Community Mentors Club has embarked on within the D.C. community. Last fall, members of the club visited another local elementary school to celebrate a harvest festival. That visit, said Ni, resulted in an ongoing partnership with the school, where each Carey student is matched with a local family in a cultural exchange. While the main goal of the club is to provide value to the local community, it’s also about immersing Carey’s Chinese students into American culture. Both Ni and Wei, who will graduate from Carey in 2016, plan to pass the expo off to the next wave of incoming Carey students so the tradition can continue. “Part of our goal is to create a sustainable volunteer program for the school,” Wei said.